Over 50,000 people marched, paraded, danced and called for an end to homophobia in Mexico City’s gay pride march Saturday. 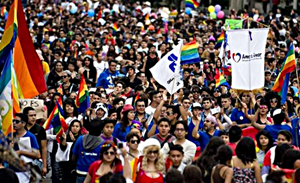 LGBT marches and pride parades have been held in Mexico City since 1979. In 2001, Article 1 of the Federal Constitution was amended to prohibit discrimination based (among other factors) on sexual orientation under the vague term preferences. In June 2003, an anti-discrimination federal law took effect, creating a national council to enforce it. The same year, Amaranta Gómez ran as the first transgender congresswoman candidate affiliated with the former Mexico Posible party. Yet in 2012, Mexico had one of the worst rates of hate crimes against LGBT people, due to their orientation since 1995. A total of 86 LGBT people were killed in crimes authorities said were due to homophobia, according to a study by the People’s Coalition Against anti-Gay Hate Crimes.